The 44 Sedan is a model, class A approval,which measures almost 14 metres long with beam of 4.21 metres. It stands out for two very roomy double cabins, two generously fitted bathrooms with shower enclosure, and plenty of space for wardrobes and drawers. On the bridge, behind the steering position, is a large dinette area with bench seats and dining table. The corner galley, on the cockpit side of the saloon, features a full set of appliances and a large working area. A folding plate glass door leads to the cockpit, which has a large sundeck that converts into a bench seat with central table for open-air lunches. A “traditional” gate in the stern gives easy access to the bathing platform, which can be hydraulic on request to facilitate entering and exiting the sea. 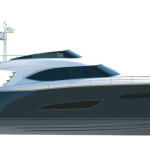 The distinctive details, finishes and accessories of the Austin Parker style designed by Fulvio De Simoni are still very much in evidence, especially in the unmistakable dark blue livery, the wide, protected “walk-arounds” from stern to bows, the large sundeck, the use of mahogany and teak, and the use throughout of AISI 316 steel. The range is good thanks to a 1600 litre tank supplying the two 480 HP Cummins engines with straight shaft driveline, and there is also a plentiful fresh water reserve of 450 l.